Every asset you upload contains additional informative data. It is technical data about the media it selves but also additional data that is added after the creation of the asset. This additional information is often referred to as metadata and can be modified later by an application or user. From the properties tab, it is referred to as Client Defined Fields. The technical data can not be modified since it is the actual information about the asset size, frames/sek, codecs used etc. Other parts of the metadata (properties) are added by supporting applications during production/broadcasting or similar, but there is also room for a user to add additional information (metadata) to simplify daily routines. Most common manually added metadata are words to categorize the asset and to make it easier to search and locate the asset later. These words are often referred to as Tags. Mediabank support any type of metadata/Tags and an administrator can customize it to serve the company preferences. The below images illustrates view from AdEx, Review & Approval and Library, but it is similar to all applications in Mediabank. 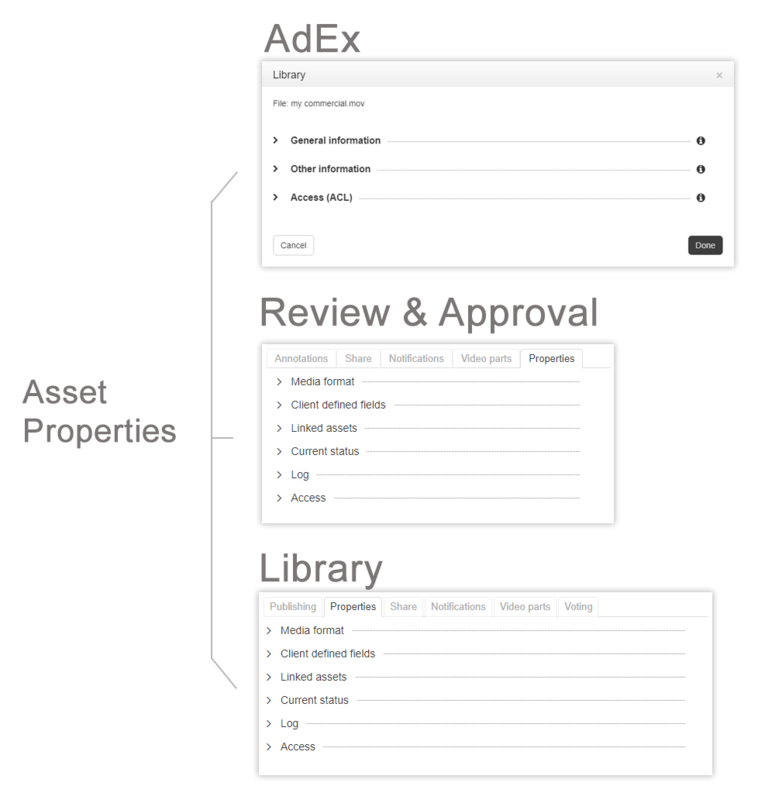 These three applications reveals your asset properties. Typically when you upload your asset, you use AdEx forms to manually enter additional information, also known as Tags, Client Defined Fields or Metadata. This information can later be found under the Properties Tab in applications like Library and Review & Approval. Looking at the image below, the simple AdEx form enables a user to enter "general information" like; Title, Sub-title, Category and so forth. The "Other information" could be Content type, Season, Series and other typical broadcast information. When the asset upload is done, the user can review and modify parts of the properties in the Mediabank applications if he/she have the administrative rights. From the Mediabank point of view, the following information is regarded as the asset properties. Media format - technical information like asset size, frames/sec, codecs used etc. You can not modify this. Client defined fields - Typical content from the AdEx forms that you manually (or automatically) added to the asset during upload (import). Linked assets - Mediabank can link assets. When loading the asset the other linked asset will be loaded in the Title module in Review & Approval. Typical first and second half of a soccer match or similar. Looking in the properties tab, you can see all the linked assets. You can also find the asset Media Id. This is very important. The asset Id is unique and essential information when you experience problems with an asset. Current status - Is it archived, backed up or is the original asset missing? Is it uploading or finished? If you encounter problems you should check the asset property status. Log - Who has read/loaded the asset, published, uploaded deleted the asset? Was it archived? The log contains the assets historical lifeline and can be used for troubleshooting. Access - Who has access to the asset. It lists the users, groups or anybody that have access to the asset. Click on the MENU button in the Header module. Look in the Tasks silo and select Quickview.